The E355 is a 14hp Eurorack module with two LFOs that use our unique morphing algorithm to create over 10,000 different waveforms. the two outputs can vary from one cycle in 12 minutes to 1000Hz, with high and low ranges available. The use of a 24 MHz 32-bit ARM processor means virtually no frequency drift. 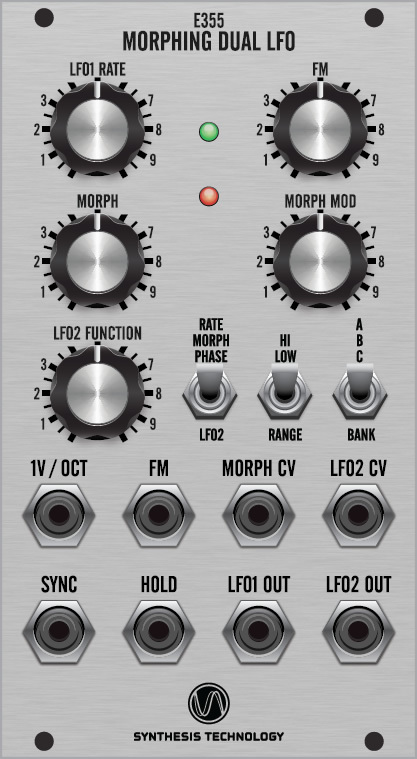 LFO1 can be thought of as the "master" LFO as it always has independent rate, FM, and morphing. Each LFO tracks 1v/Oct and all parameters are under voltage control. There are two leds that vary in brightness based on output amplitude in 128 levels. Bank B: the waves in Bank A are repeated in frequency as 1x, 2x, 3x, 4x, etc up to 8x. This allows the LFOs to have a very wide range between them if necessary or to use this as a basic audio oscillator (limited to 1khz). Bank C: the 64 waves taken from Bank C of the E350 Morphing Terrarium (created by Robert Rich) to go way beyond the ordinary. Sequences of notes, arpeggiated effects, pings, swoops, and lattice phase modulation are just a few of the options contained within. In the audio range these can be harsh, noisy, and crunchy. There are also two external inputs to either sync the LFOs or to hold ("freeze") the outputs at the current stage of the waveform. Sync Reset LFO outputs to -5V. Jumper-configurable to sync LFO1+LFO2 or LFO1 only. Hold CV input of +1.2V or higher will freeze the levels of the LFO outputs. Jumper-configurable to freeze LFO1+LFO2 or LFO1 only.